Ask any audiologist or hearing aid industry expert and they’ll likely know about the Signal to Noise Ratio. But ask a hearing aid user, and you might just get a blank stare. As a hearing aid user myself, I enjoy educating others on key hearing loss topics they might not otherwise be familiar with, and Signal To Noise Ratio is one of them. So let’s get to it, what is SNR (Signal to Noise Ratio) and how does it work? Imagine you’re in a busy bar or a crowded restaurant, you’re wearing your hearing aids but are still finding it difficult to keep up the conversation with someone right next to you. Let’s say this person’s name is John. Now, John’s got perfect hearing and while he’s saying he’s finding it hard to hear you through the noise, he does not seem to struggle at all as he picks up every word you’re saying. But when it’s your turn to listen, you’re struggling again. John’s not lying to you, he really hears less in noise, however, as a person with perfect hearing, he can handle a higher level of noise. That’s where the Signal to Noise Ratio comes into play. Signal to Noise Ratio is the gap between the Signal and the Noise. You could think of the Signal as useful information—the sound you want to hear—while the Noise is all the other irrelevant information. In a bustling restaurant for example, this could be other voices, music and clanking cutlery that threatens to overwhelm your conversation. Put simply, people with perfect hearing can cope better with a lower Signal to Noise Ratio. If you’re hearing impaired, you’ll need it to be higher. The bigger the gap (the Signal much louder than the Noise), the easier it is for your ears to focus on what you want to hear. At the top is SNR from Excellent (24dB, a big gap between Signal and Noise), to Very Poor (-6dB). A 24dB situation could be a conversation in a quiet room, with only subtle background noise, say a TV on low. Because the Signal has little to fight over, the conversation will be clear and easy to focus on. 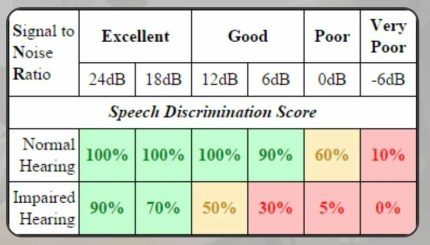 Let’s take a look at the bottom of the table, the Speech Discrimination Score. This is a score to determine how much you can hear at different SNRs. Even in Excellent SNR situations someone with impaired hearing already scores lower than Normal Hearing, and as we move along the drop-off is much more noticeable. In a Good 6dB situation, let’s say a lively dinner party, the figures speak for themselves. While those with normal hearing might notice this background noise, if you’re hearing impaired a conversation could be a real struggle. Now that you know what SNR is and how it affects you, you can start thinking about ways to make noisy situations easier to manoeuvre, and altogether less stressful. You can either try to improve your Speech Discrimination Score in low SNR environments by increasing the signal, or decreasing the noise. Or, you can try to create an environment with a better SNR. For example, by asking a waiter if they can turn down the music a notch you can make a world of difference. At a party, you could take the initiative and suggest you move the conversation into a quieter room. Why not even educate your friends on how SNR works? Did you know about the Signal to Noise Ratio? What have you done to improve the SNR in a situation recently? I’d love to hear your thoughts in the comments below. Gianluca Trombetta Gianluca Trombetta is a hearing aid user and an expert in living well with hearing loss. 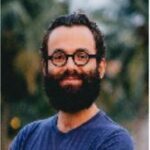 He teaches hearing aid users how to maximize their communication abilities even in the most challenging situations at getsuperhumanhearing.com. What are Directional Microphones in Hearing Aids? What is the Most Powerful Hearing Aid?